They’re a biscuit with the richness of a scone. Crunchy on the outside and tender on the inside, they offer an elegant touch to the standard biscuit. Not that there’s anything wrong with the standard biscuit, I love ’em! But cream biscuits are different, they’re what I call Sunday biscuits. You can top these with sugar or leave them plain. With a dozen, I made half with sugar. Let me tell you why…Without sugar topping, they make and excellent accompaniment for dishes with gravy. With sugar, they’re the perfect treat with coffee or tea and some butter and peach preserves. Peach preserves make everything better! All that plus they’re quick and super easy! Top all with butter and some with sugar if you want…believe me, you want this! Preheat oven to 425 degrees. Sift flour, baking powder, and salt into a large bowl. Stir in 1 tablespoon sugar. Add cream, stirring until dough is formed. Dough will be soft but not sticky. 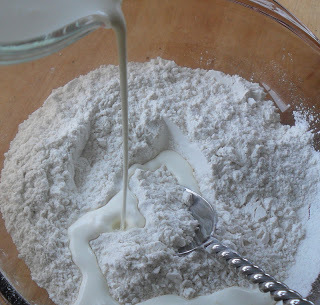 Place dough on a floured surface and roll to 1 inch thickness. Use a 2-inch round cutter to cut 12 rounds, re-rolling dough as needed. Place biscuits 2 inches apart on a lined baking sheet. 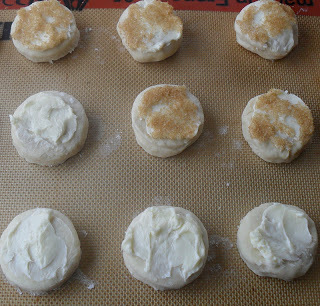 Brush tops with softened butter. If desired, sand with sugar. Bake for 14 minutes, until golden. Serve warm. « Chicken & Rice Stew…Surprisingly Skinny Too! yummy recipe…I will try it soon….This makes me drool..Bookmarking it.. I love cream biscuits! I’m totally going to steal your brilliant idea of adding sugar to them. MMmmm! Just what I am looking for this weekend! I love any kind of biscuit. These are similar to the ones I make for strawberry shortcakes. Yum! Oh, yum! I’ve never had a cream biscuit but that’s about to change! They look fabulous! these look so incredibly buttery and moist and yummy! Wow, I am liking them more than my eggnog ones! @Lucy…I bet those are some good shortcakes! Shawn, these sound as simple as they look delicious! I’m definitely going to try this one out and overcome my “baking” phobia. 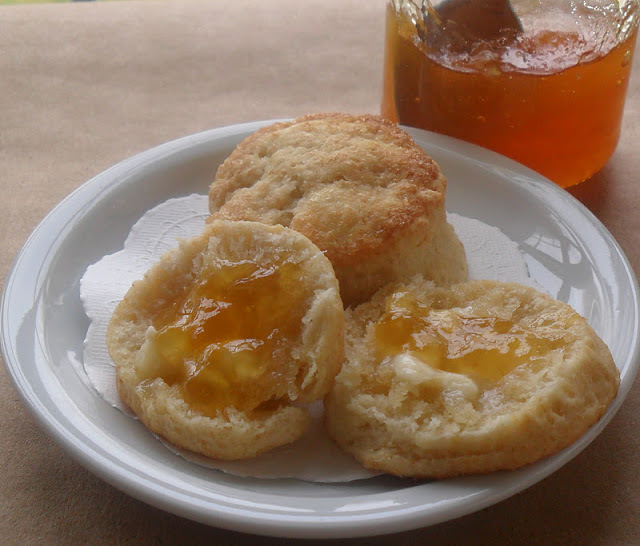 I’m a huge fan of scones and jam, so these a must-try.